Louisville was founded in 1778 by George Rogers Clark and named after King Louis XVI of France who helped the Americans during the Revolutionary War. It was part of the Union during the Civil War but joined the Confederacy at war's end. The city is a major shipping port due to its central location. Its airport, located only 7 miles from downtown, is UPS's worldwide air hub. The population is around 750,000 with 1.335 million in the metro area. In the early days of Bourbon distilling Main Street in downtown was known as Whiskey Row and was recently named one of "America's Top Ten Great Streets". There are now 9 museums within 4 walkable blocks of Main Street. 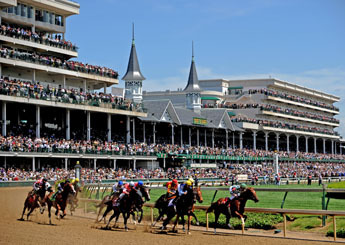 Churchill Downs- The Kentucky Derby has been held annually since 1875 on the first Sunday in May at Churchill Downs. Over 160,000 fans fill the racetrack on Derby Day. It was founded by Meriwether Lewis Clark Jr, grandson of William Clark (Lewis & Clark) and grandnephew of the city's founder George Rogers Clark. The Mint Julep is the official drink of the Kentucky Derby. Over 120,000 are made for Derby fans every year. Ingredients: 2 oz Kentucky Bourbon, 1 tsp. sugar, 1/2 tsp. water, 2-3 mint sprigs, shaved ice. Fill 3/4 of cup with shaved ice. Add Bourbon, water and sugar. Stir gently. Add ice to fill cup. Garnish with mint sprig. 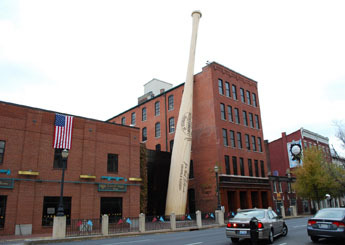 Louisville Slugger Museum & Factory- Located at the manufacturing plant and headquarters of Hillerich & Bradsby celebrating 120 years, with over 100 million bats sold. Over 60% of major league players use the Louisville Slugger bat. There is a 120-foot steel bat that rests against the wall of the building. Watch bats being made or swing a bat used by Johnny Bench or Mickey Mantle. 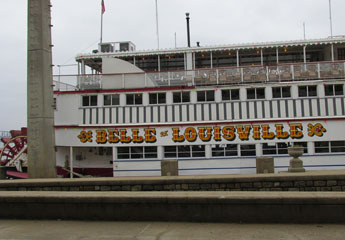 Belle of Louisville (Seasonal)— Cruises the Ohio River from Memorial Day to Labor Day. Built in 1914 (100 years in 2014) it is the oldest operating steamboat in the U.S. and is a National Historic Landmark. Moored downtown, it is owned by the City of Louisville. 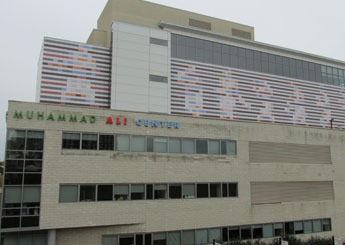 Muhammad Ali Center- Provides an international educational and cultural center with exhibits, a five-screen orientation theater film, Civil Rights era media footage, video-on-demand of Ali's fights, meeting and event space and two changing exhibit galleries. Kentucky Derby Museum- Adjacent to Churchill Downs. There are racing artifacts, trophies, photographs, interactive displays and a challenging simulated race where you pick one of the horses and move them during the race. 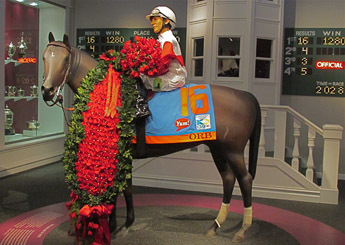 The museum highlights thoroughbred racing and of course the Kentucky Derby, with videos of past Derby's and a 360-degree high-definition multimedia introductory show. 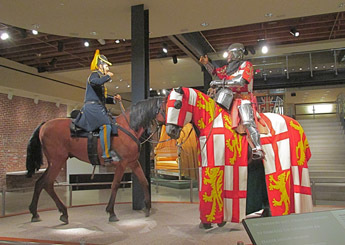 Frazier History Museum - The museum has a world-renowned collection of arms, armor and related historical artifacts, in collaboration with the Royal Armouries. View the family bible of Daniel Boone, the bow used by Geronimo and the pistols of General George Custer. Relive 5,000 years of historical events. Louisville Mega Cavern- Founded in the 1930's it is rich in history, geology, recycling and green building technology. 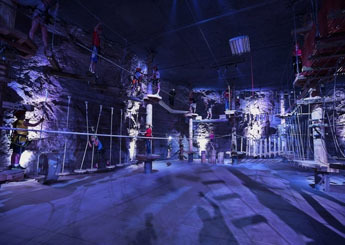 Located in a 100-acre former limestone quarry, this natural wonder is one of only six places in the world with an underground tram ride and the world's only underground zip line. Located under the Zoo, it could hold 50,000 people and is a constant 56 degrees (perfect temperature for a wine cellar). 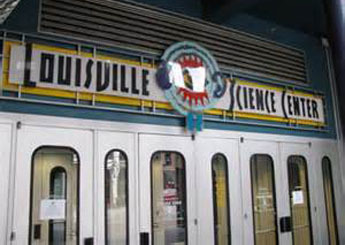 Kentucky Science Center- Kentucky's largest hands-on science museum with over 150 exhibits. Experience science, mathematics, technology, physics, engineering, telecommunications and manufacturing, as well as an IMAX theater. The Speed Art Museum- might have replaced the Science Center, is currently closed for expansion and renovation. 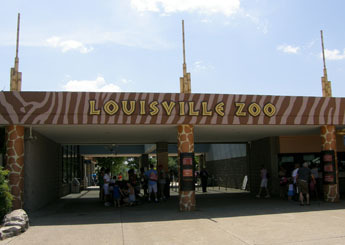 Louisville Zoo- Established in 1969 on 135 acres as the Louisville Zoological Gardens. More than 1,300 exotic animals. Ride the zip line, visit the splash park and interact with the animals. The zoo's newest exhibit, Glacier Run, is a recreation of Churchill Canada, the Polar Bear capitol of the world. There are daily animal trainings and zookeeper talks. 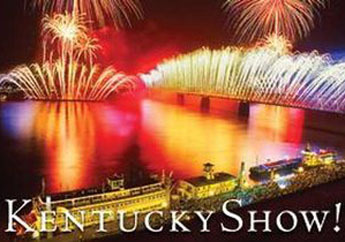 KentuckyShow!- Held in the Kentucky Center for the Performing Arts this 1/2-hour multimedia experience is a sampler of the beauty of the Bluegrass State, showcasing all the regions. Kentucky's own Ashley Judd narrates it. 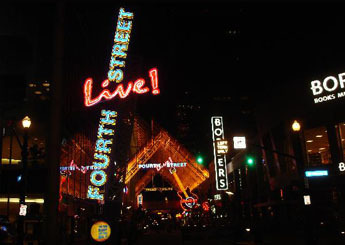 Fourth Street Live- This entertainment district offers bars, restaurants, clubs as well as outdoor concerts and events around a covered street. Across the street from the Seelbach Hilton. Urban Bourbon Trail- Without a public distillery tour in the city, but with so much bourbon heritage, the Louisville Convention & Visitors Bureau began a marketing initiative in 2006 promoting Louisville as the Gateway to Bourbon Country. The Urban Bourbon Trail Passport Program was developed to link the world-class bourbon bars that already existed in the city. The growth of Louisville's restaurant scene, has led to the expansion of the Urban Bourbon Trail to 27 establishments. The 94-page passport identifies all 27 restaurants on neighborhood maps with addresses, hours of operation, short descriptions and suggested cocktails, along with space for notes. The booklet also includes instructions on how to use the passport and pointers on how to taste bourbon. Each establishment must carry at least 50 bourbons to be included in the passport. 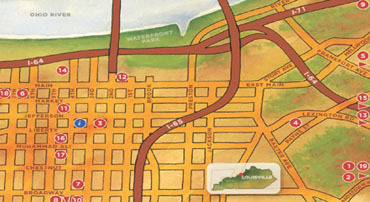 Urban Bourbon Trail "Trailblazers" are invited to "pick six" stops, collecting unique stamps from each in order to be rewarded with a special gift that can be claimed at the Louisville Visitors Center (301 S. Fourth St.). Trailblazers are encouraged to take their time enjoying Bourbon responsibly and must be 21 or older. The pace is entirely up to the participant as there is no time frame for completing the Passport. 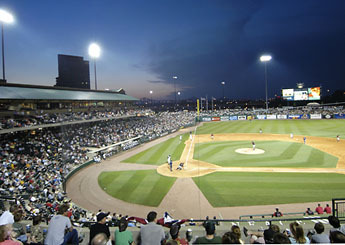 Louisville Slugger Field (Louisville Bats baseball) (Seasonal)- The stadium for the AAA affiliate of the Cincinnati Reds was opened in 2000 and seats over 13,000. It is located one block from Waterfront Park. There is a statue honoring Louisville's own Pee Wee Reese at the entrance of the stadium. 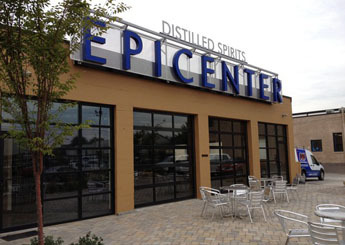 Distilled Spirits Epicenter- This distillery and education center is designed to enhance the artisan distilling craft. It includes Moonshine University and Grease Monkey Distillery as well as Challenge Bottling that can be utilized by small production distilleries. Next-door is Flavorman, which was voted Louisville 2013 Small Business of the Year. It is not open to the general public. They are the source of many of your favorite flavored beverages. 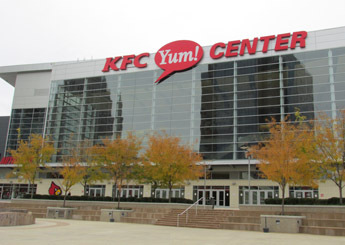 KFC Yum Center- This 22,090 capacity downtown arena opened in 2010 in the waterfront area. It is the home of the NCAA Champion Louisville Cardinal men's basketball team (women's also) as well as many concerts and exhibitions. 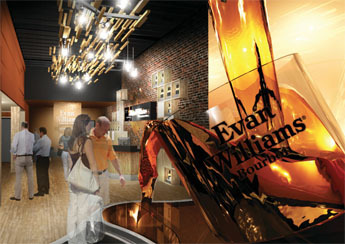 Evan Williams Bourbon Experience- The recently opened Evan Williams Bourbon Experience is a multi-million dollar fully functioning artisanal distillery, which celebrates the legacy of Evan Williams, Kentucky's first distiller. They have renovated their historic building in the heart of what was once called "Whiskey Row".The facade of the building features a five story high Evan Williams Bourbon bottle, as the neck of the bottle and a large glass in the lobby form a flowing "Bourbon fountain". The tour takes one back to Evan Williams' original distillery, Louisville wharf scenes and high definition video renderings of turn-of-the-century Whiskey Row. Those over 21 years old can enjoy a tasting of premium Bourbons in two different themed tasting rooms. There is a large retail store and a "speakeasy" themed event space in the lower level. 21c Museum Hotel- Opened in 2006, this 90-room boutique hotel was Conde Nast Traveler 2013 #1 hotel in the South, #8 hotel in the US and #46 worldwide. It is North America's first museum dedicated solely to collecting and exhibiting art of the 21st century. Their Proof on Main is possibly the best restaurant in town. Avid art collectors, the Brown family (Brown-Forman) have added museum hotels in Cincinnati, Ohio and Bentonville, Arkansas. 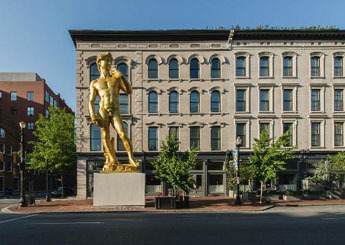 Look for the giant statue of David outside the hotel. 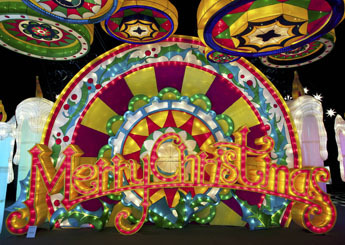 Galt House Hotel KaLightoscope- Enjoy interactive and magical luminaries handcrafted by Chinese artisans. This is a spectacular setting for kids of all ages. Sit with the Snow Fairy Princess and tour her Christmas Village. Hop on Santa's Sleigh and flew through the sky and then watched the video. Kids can learn to make snowflakes and can enter a Gingerbread House contest. Do your kids want to have breakfast with Santa or Tea with the Snow Fairy Princess? Don't forget the Peppermint Express Train Ride. This is every kids' dream visit (and the adults love it also). 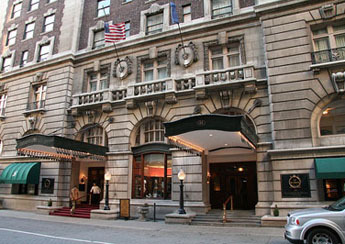 Seelbach Hilton Hotel- This Beaux Arts Baroque 320-room 4 Diamond AAA property is located in the middle of downtown. It can't become a 5 Diamond property because it does not have a swimming pool. However, their Oakroom is the only 5 Diamond Restaurant in Kentucky. Built in 1903 by Otto & Louis Seelbach, with bronze from France, hardwood from the West Indies & Europe, linens from Ireland, Turkish and Persian rugs, and marble from all over the world. In 1907 they added a Bavarian-style Ratskeller that has recently been renovated along with the rest of the hotel. This was a favorite hangout of Al Capone and the 10th floor ballroom inspired F. Scott Fitzgerald when he wrote the wedding scene in The Great Gatsby. Historic Old Louisville- The city's first suburb with Victorian era and early 1900s homes. There are over 1,400 structures, most built between 1885 and 1905. Located just south of downtown. 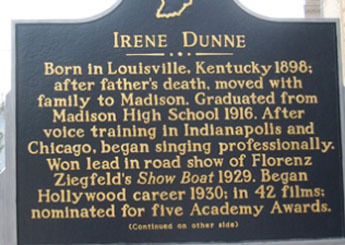 Famous people who were born, raised or gained fame in Louisville include: Diane Sawyer, Tom Cruise, Jennifer Lawrence, Victor Mature, Irene Dunne, William Conrad, Jack Warden, Ned Beatty, Hunter S. Thompson, Tod Browning, Lionel Hampton, Wilson Pickett, Muhammad Ali, Bud Hillerich, Pee Wee Reese, Denny Crum, Rick Pitino, Paul Hornung, Johnny Unitas, Fuzzy Zoeller, George Rogers Clark, Zachary Taylor, Colonel Harland Sanders, George Gavin Brown, Edwin Hubble, and Louis D. Brandeis. Waterfront Park- In the middle of downtown this 85-acre oasis sits along the Ohio River. There are water fountains, bike rentals, picnic areas and live shows and festivals.